I'm always on the lookout when it comes to little white dresses. It's one of those looks that I absolutely love on everyone else but feel somewhat uncomfortable in myself. Maybe it's because I haven't found quite the right one, or the fact that whenever I wear white I spend every waking minute checking to see if I have yet ruined whatever it is that I'm wearing. The worst bit is that I'm not prone to spills and I've made a habit of checking seats before sitting. No one wants to sit in a mystery puddle on the subway, even if there's a 90% chance that it's probably just rainwater. That 10% of unknown, nope. 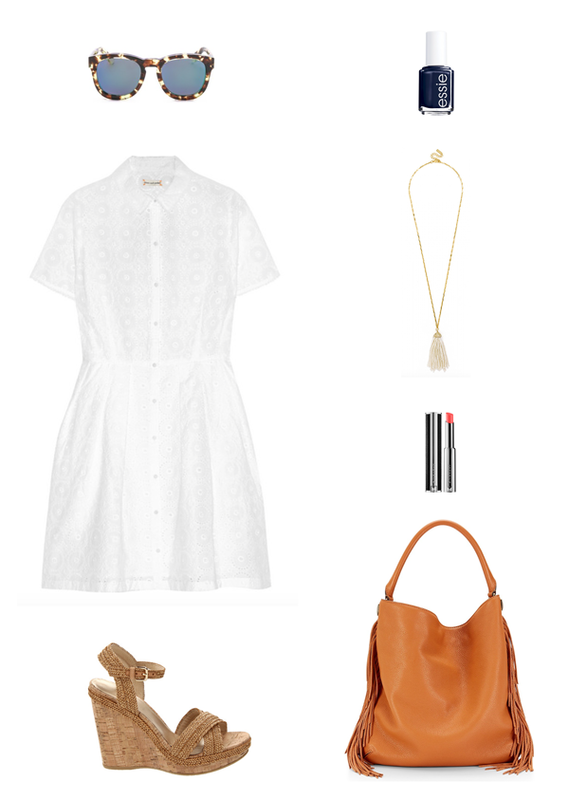 I love this sweet Chinti and Parker shirtdress, yet another style I'm forever searching for. It's the kind of thing I'd imagine wearing on a quiet morning stroll through a seaside town. I'd pair it with neutral wedges, a fringed handbag with a necklace to match, navy blue nail polish, and a classic red lipstick. That dress is so cute! And I am absolutely loving that Essie polish... so pretty! Those wedges are amazing too! That may be the perfect little white dress! So cute! That white dress is perfect for summer. That dress is so perfect for the Summer and give me all the fringe!!! I love white dresses! They are my go to's! Or white I love white too! That dress is perfect! I love white dresses for summer. I am constantly spilling on myself, so I have to be extra careful. But I love them so much! This is such a gorgeous look. So Grace Kelly-esque! Love the simplicity of this dress. This is a perfect example of "less is more." Love this look! So perfectly patriotic. Also love the imaginary scenario... a stroll through a seaside town. Can I come? ?